Oxford Fashion Studio Supporting fashion entrepreneurs to build global, high-end fashion brands. Founded in 2009, Oxford Fashion Studio has presented collections from 525 designers from 61 countries to date. Supporting fashion entrepreneurs to build global, high-end fashion brands. 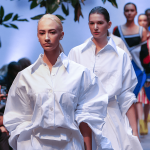 Each new wave of talent brings a unique set of ideas, inspirations, and original concepts to broadcast their collection to an audience of the most influential press, influencers, and buyers from around the world.